This study tests a typology of homelessness using administrative data on public shelter use in New York City (1988-1995) and Philadelphia (1991-1995). 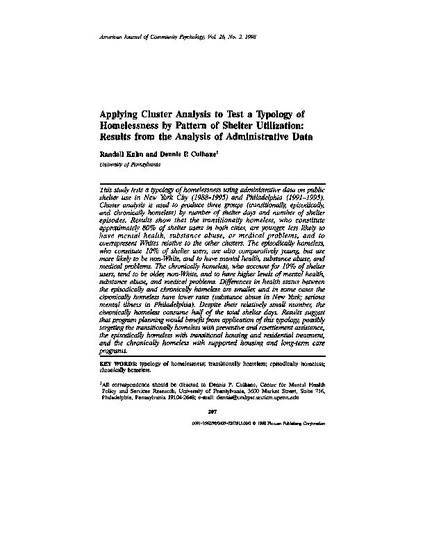 Cluster analysis is used to produce three groups (transitionally, episodically, and chronically homeless) by number of shelter days and number of shelter episodes. Results show that the transitionally homeless, who constitute approximately 80% of shelter users in both cities, are younger, less likely to have mental health, substance abuse, or medical problems, and to over-represent Whites relative to the other clusters. The episodically homeless, who constitute 10% of shelter users, are also comparatively young, but are more likely to be non-White, and to have mental health, substance abuse, and medical problems. The chronically homeless, who account for 10% of shelter users, tend to be older, non-White, and to have higher levels of mental health, substance abuse, and medical problems. Differences in health status between the episodically and chronically homeless are smaller, and in some cases the chronically homeless have lower rates (substance abuse in New York; serious mental illness in Philadelphia). Despite their relatively small number, the chronically homeless consume half of the total shelter days. Results suggest that program planning would benefit from application of this typology, possibly targeting the transitionally homeless with preventive and resettlement assistance, the episodically homeless with transitional housing and residential treatment, and the chronically homeless with supported housing and long-term care programs. The author, Dr. Dennis P. Culhane, asserts his right to include this material in ScholarlyCommons@Penn.